I actually made a spreadsheet for redfront members (bla and rod are added). to discuss stuff right. I don't have permission either. People who aren't a member of Red Front don't get permission. I thought I was, at least I was on the red front side on last battleground. Lol kipz. I suppose that's technically true. Yes Smj, you can ask to join as a permanent member if you want, but Fiah, Tuto, Matty and many others have fought on the Red Front side in many battles, but sometimes join the opposite side. I, Kip and Naru are the only actual members currently, which means we're loyal to the Red Front in all battles. Front membership is something that you must request, but it's also good to have some users who haven't joined fronts to help even out teams when there are battles. I know we've spent a long time carefully building these bases, but it seems like people are put off by the obsidian forts, and I suppose the lava defenses are only stronger, although we haven't 'tested' that. 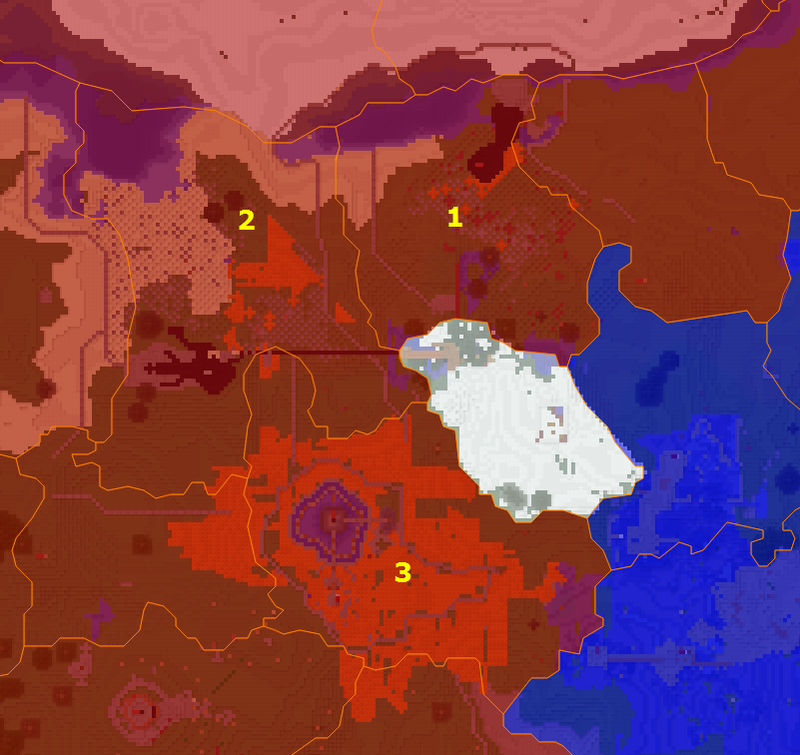 So my suggestion is that we in the Red Front agree to rebuild the bases in zones marked with 1, 2 and 3. However I'm not really sure what kind of design would be balanced enough. The obsidian fort in the southwestern zone seemed balanced imo, during the fight with the Sequoia Front, even when considering they were attacking up a steep cliff with a long route to the flag. The new rugged terrain defenses in 1 and 2 turned out to make the ground defenses a lot stronger (although they only played a role in the battle for 1), so an option could be to remove those. It's important that the defenses are balanced for ground combat and that focus doesn't shift to skybridges and stuff like that. 1: Remove the obsidian fort and build a new one very similar to the one in the battle with Sequoia Front, and remove the rugged terrain obstacles. 2: Remove the Red Front traces from the zone and then gift it to Fiahstorm, who can decide who should have it if he's no longer interested, just to end that old spite over the battle. 3: Remove the lava from the zone to begin with (but I'd like Komrage's opinion on that zone since he built it and I know it's not fun to just tear down what you've put a lot of effort into). In the end, I think the Red Front has enough territory to allow some experiments with less strong defenses near the front, to see what makes for fun and balanced fights. I agree; I found the battle with the sequoia front to be very entertaining and fun; but the battles with the rugged terrain defenses I found just annoying. I feel like a combination of both rugged terrain defenses and obsidian forts makes bases unbalanced; either by themselves might be doable.